With its 2.7 inch colour touch screen and truly innovative and sophisticated features, the Sekonic Speedmaster L-858D-U leads the way to the next generation of light measurement control as the world's first multi-function light meter for photographers and filmmakers. Leveraging over 60 years of experience in the image-making world with cutting-edge technology, the Sekonic Speedmaster L-858D-U has undergone a significant design change and boasts a comprehensive feature set sure to meet and exceed the demands of today's photographers and filmmakers. The first meter of its kind capable of measuring flash duration, while also being able to achieve an accurate ambient exposure reading in dimly lit scenes as low as 0.1 lx, the Sekonic L-858d-U provides imagemakers of all levels with the critical exposure data they need to create stunning and beautiful imagery. The first to provide wireless compatibility with Elinchrom, Phottix, and PocketWizard products, the Sekonic Speedmaster L-858D-U also provides ultimate control to photographers seeking a faster and more streamlined workflow. Limitless creative possibilities are within reach through the meter's ability to measure High Speed Sync (HSS) and calculate proper ambient-flash exposure for precision flash exposure control. 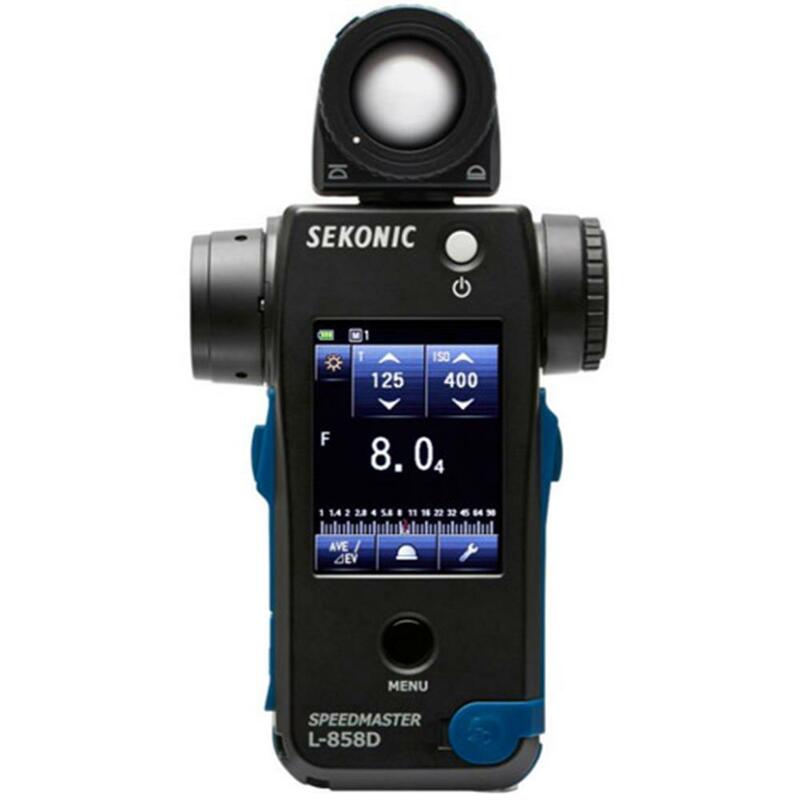 With an increased light-sensitivity and extended ISO and Shutter Speed Ranges, the Sekonic Speedmaster L-858D-U enables all imagemakers to obtain measurements in extremely low light and turn those readings into creative decisions. Finally, matching the high-ISO capabilities of today's cameras, by accurately metering in low-light, is finally possible. Understanding flash duration is the first step in freezing fast-moving subjects. Since all cameras are limited to relatively low sync speeds, stopping motion in a single image is often achieved by leveraging short flash durations with the camera?s max sync speed. A long-held secret of some of the world's most talented photographers, the key to freezing action consistently is found in being able to measure flash duration. Photographers are now able to do this easily for the first time, demystifying one of photography's most challenging techniques. Increased ISO capabilities in today's cameras have created a need for light meters to increase their ability to measure light in the dimmest of settings. With an additional 3-stops of light sensitivity for incident light, 2-stops of light sensitivity for reflected light (spot), and an ability to capture a reading down to 0.1 lx of Illuminance, accurately metering scenes lit by candlelight or getting the right measurement for long-exposure night photography is now a possibility. The L-858D-U is the first meter of its kind that can measure the stroboscopic pulses fired from strobes when they are used for Hi-Speed Sync. Finally, photographers now have an accurate way of measuring their lights when they want to overpower the sun or achieve a very shallow depth of field through using HSS. The L-858D-U is especially useful for on-location shooting to lighten shadows or reduce background detail. That's because it measures ambient and flash simultaneously and automatically indicates the percentage of flash in the total exposure. You can easily adjust the ambient flash mix by turning the Jog Wheel. The digital display indicates the camera settings and an analog display shows the relationship between ambient and flash and the total exposure. Shoot with the equipment you use most. Make tests under daylight and studio lighting. Exposure Profile Target requires an 11-shot bracket (0, +/- 5EV). Exposure Profile Target II shown at the right requires a 3-shot bracket (-3EV, 0, +3EV). Make a spot reading of 18% reflectance tone and incident reading in front of target and record data. Shoot the bracketed shots based on incident light measurement. Download test images into computer. If shot in RAW, convert to TIFF for computation. Enter ISO, incident, and reflected light shooting data. Then select images and press OK to watch the Sekonic Data Transfer Software program graph the dynamic range of your DSLR camera. Save the data for transfer to the L-858D. Photographers and filmmakers using high-density ND filters now have a filter factor of up to 12EV. Save up to 30 "favoorites" to instantly know what exposure compensation needs to be considered.